I’ve had “penny in a bottle” written down as a potential comic idea for about 3 years now. If you’re a part of the Massive Pwnage Minecraft server, I just wanted to remind you that there’s an official thread in the forums. Check it out! 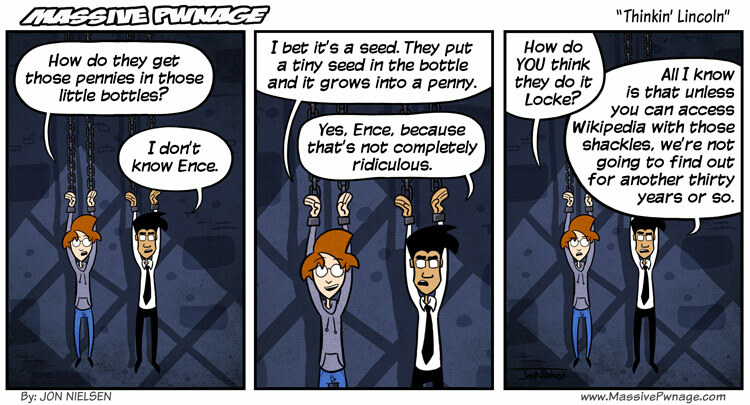 This entry was posted on Monday, February 21st, 2011 at 12:00 am and is filed under Comics. You can follow any responses to this entry through the RSS 2.0 feed. Both comments and pings are currently closed. How can i join the MC server? This question answers probably one question, but asks a million more. This comic answers one question, but asks a million more. How large is this bottle? Where’s the bottle and how large is it? What’s the seed for Pennies? Do not understand. I actually know what you’re talking about O.o I think. Those tiny little bottles with the penny inside them? They kinda cheat a little in making them. They put a penny in a half-blown glass bottle, then finish it.